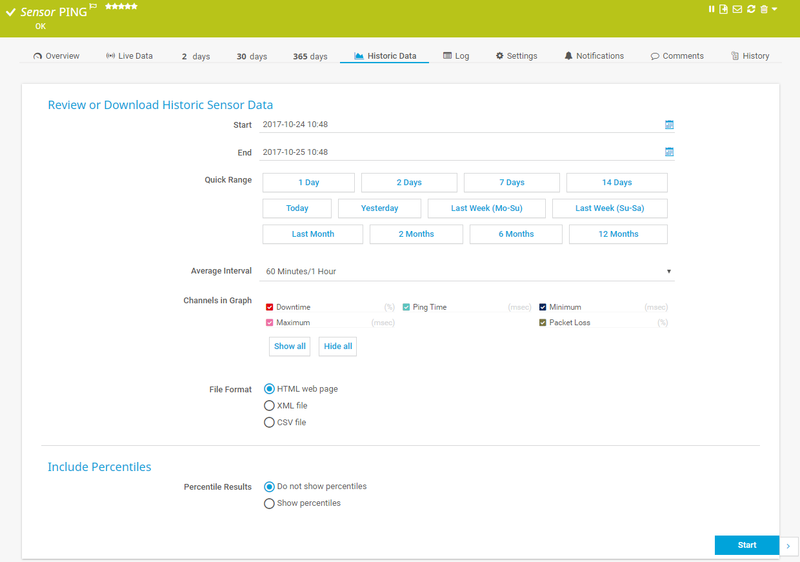 For quick reviews of a sensor's monitoring data, use the historic data reports as an alternative to the comprehensive Reports function. You can run and view a report of the historic data for each single sensor, on demand. Additionally, you can export this sensor data as XML or CSV files to your computer for further processing with third party applications. There are two ways to open PRTG's historic data reports: either you click the Historic Data tab on a sensor's detail page, or you choose Sensors | View Historic Data from the main menu. All object pages (probes, groups, devices, and sensors) have an interface providing tabs. By using the tabs you can navigate through various sub-pages of an object to show your network status, view monitoring results, or change settings. When you open historic data reports via Sensors | View Historic Data in the main menu, PRTG will ask you to choose the sensor you want to create a report for with the Object Selector. This field is only visible if you open the historic data function via the main menu. Select the sensor you want to create the report for: click the reading-glass symbol to open the object selector. For more information, see section Object Selector. Specify the start date and time of the data you want to review. Use the date time picker to enter the date and time. Specify the end date and time of the data you want to review. Use the date time picker to enter the date and time. 1 Day, 2 Days, 7 Days, or 14 Days: Set the date range to the respective day(s). The current time of the current day is the end date. Today, Yesterday, Last Week (Mo-Su), Last Week (Su-Sa), Last Month, 2 Months, 6 Months, 12 Months: Set the date range to the last matching period. It starts at 00:00 and ends at 00:00 of the particularly following day. With this option, you can activate and configure averaging. Select an interval for which PRTG will calculate the average value. You can choose between No Interval (no averaging is performed and only raw data displayed), a few seconds, minutes, hours, or a whole day (24 Hours). A shorter interval results in a more detailed report for this sensor. The best settings for you may vary, depending on the scanning interval of the sensor, the selected date period, and the intended use for the report. It might be useful to try different settings and compare what the results look like. Please also see the section Automatic Averaging below. Select the channels that you want to include in the graph of the report. You can select or deselect individual channels with the respective check boxes, and select or deselect all channels with the buttons Show all or Hide all. PRTG will only show the data of selected channels in the graph of the report. Note: The report table will always show the data of all channels. [Several specific nodes]: Use a specific node's data for the report. The nodes you see are specific to your setup. XML file: Export the data as Extensible Markup Language (XML) file. Usually, your browser shows a download dialog when you use this option. CSV file: Export the data as Comma Seperated Values (CSV) file, for example, for import into Microsoft Excel. Usually, your browser shows a download dialog when you use this option. Show percentiles: PRTG adds a column to the result data tables, which shows percentiles for every sensor channel. Note: Percentiles are not available for all report templates. If a template does not support percentiles, they will simply not show up in the report, even when you enable this setting. Click Start to generate a historic data report. Note: Data reporting is limited to 5 requests per minute. Note: Reports cannot show uptime or downtime data for the Sensor Factory Sensor.